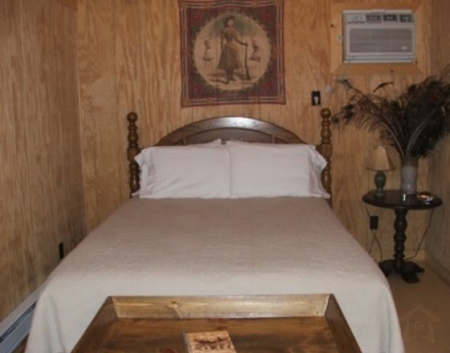 The Annie Oakley Cabin has a queen size bed, a day bed with trundle beneath and will sleep up to 4 guests comfortably. A maximum number of 5 guests are permitted, regardless of age. 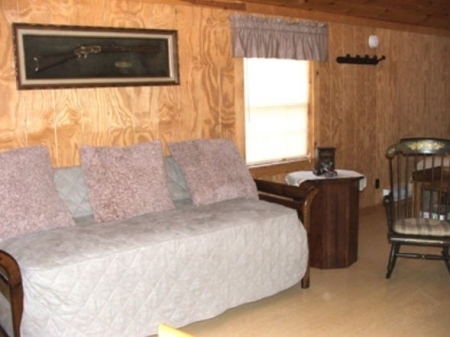 The Annie Oakley Cabin offers an inside bathroom, full service kitchen (complete with refrigerator, stove/oven, microwave, toaster, coffee maker and everything you need to prepare and serve everyday meals), 32" LCD HD television with DirecTV & DVD/VCR combo, air conditioning and electric heat. It also includes a wonderful electric fireplace for added warmth and ambiance. 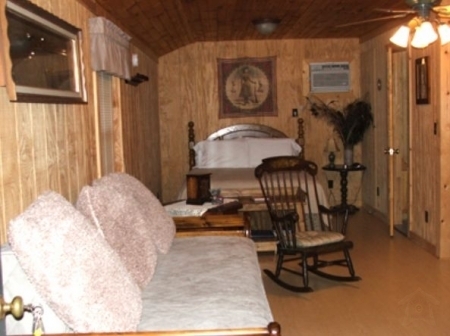 --Cabins comfortably sleep 4 guests. --$5 per night per guest over 2 guests. --Children 3 and under are free and would not be subject to the extra per person charge. 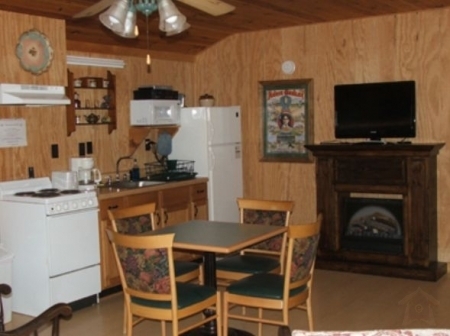 --A maximum number of 5 guests permitted in cabins, including children, regardless of age; special permission by management required for more than 4 guests to a cabin; violation of the max number of guests without management approval will result in forfeiture of visit without refund. --We're sorry, but parties with a 5th guest must must provide their own bedding and linens for that extra person. --Special offers or other discounts are not offered or available during Holidays or Special Event weekends. --This exclustion includes: Group Rates, Offer Code #101 (Friends & Family) and Offer Code #102, #103 & #104. --Military Discounts are available anytime. --On-line Reservations: A 50% deposit will be billed to your credit card account within 3 days of making your on-line reservation. The balance due will be billed to your credit card 2 days before your scheduled arrival date. If your credit card becomes deactivated for any reason and unbillable for the balance due, your reservations will be cancelled without refund. If guest would like final payment to be charged to any other credit card, other than the card on file, then it is the guest responsibility to phone in the other payments before 3 days prior to arrival. --Reservations by Mail: A 50% deposit is required within 7 days of making your reservation. The remaining balance is due prior to 30 days before your scheduled arrival date and must include an additional $150 for the security deposit. --There is a $150 inventory/damage deposit required. No personal checks will be accepted for this inventory/damage deposit. We will only accept Cash, Travelers Checks or Major Credit Cards (Visa or MasterCard) for this deposit. If you have secured reservations through our on-line reservation desk, it is stated that your credit card will be billed 1 day prior to your scheduled arrival date. However, only in the case of group reservations will this deposit actually be billed. As normal policy or for any other reason, if we do not charge your credit card for this inventory/damage deposit prior to or at time of arrival, Cozy Cabins & Cottages Corporation reserves the right to charge your credit card within 10 days after your stay in the case of any missing items or damages to property caused by you or your guests. Reservations made by U.S. mail require $150 inventory/damage deposit to be paid at time of reservation. Assuming there are no damages or missing items, your deposit will be refunded within 10 days following your visit with us. --A copy of a valid driver's license is also required. 16.75% State, Local and Hotel Taxes will be applied to all reservations.